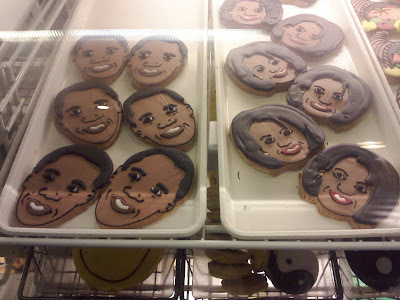 I was in Chicago for Thanksgiving, and I asked my friend Jen, "How come I'm not seeing any Obama stickers on the cars?" She said, "In Chicago, it goes without saying." I guess this is the case, because here are a few pictures I took at a deli we visited a few days later. I have to say I'm impressed at the accuracy of the drawing. 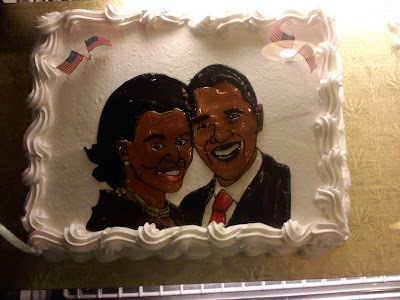 I couldn't do a recognizable Barack even in pen, much less in frosting. 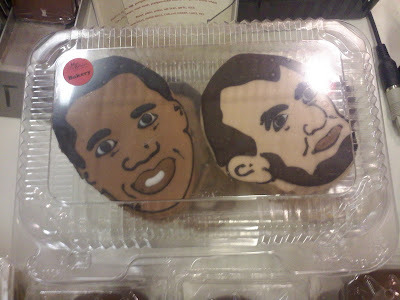 Would you happen to have the name of the deli who baked these? It's Max and Benny's, in Northbrook. Or so I am informed.